Sandwiched between the U.S states of Mayland, Delaware, Pennsylvania, New York State, the District of Columbia and Virginia, lies Chesapeake Bay, the largest estuary in North America. It is of huge ecological importance: “the bay, its rivers, wetlands and forests provide homes, food and protection for countless animals and plants”, says the Chesapeake Bay Program. Up to 150 major rivers and streams feed into the bay’s watershed. Geologically speaking, Chesapeake Bay isn’t very old. As recently as 18,000 years ago the bay was covered by dry land. Global sea levels were up to 200m lower than they are at present and the last of the great ice sheets to cover America was at its peak. The rivers which flowed along the east of the continent had to cut valleys in what is now the bay bottom, to reach the continental shelf, and drain out to sea. Fast forward 8,000 years and rising global temperatures caused the ice sheets to melt rapidly. Global sea levels started to rise, flooding the continental shelf and coastal areas, which now make up the modern-day estuary. The process was helped along by a remarkable, much older geological feature. During the late Eocene, 35 million years ago, the Atlantic margin of the U.S was struck by a 3.5 km bolide (an asteroid or meteorite). The impact crater is located about 200 km south of Washington D.C., buried below 300 -500 m of sediments in Chesapeake Bay. 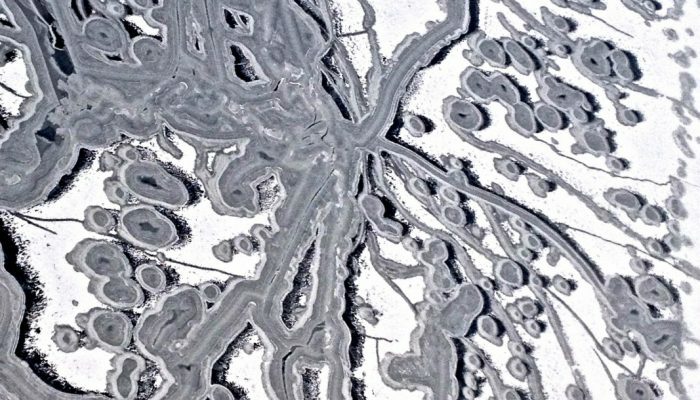 Though the crater didn’t form the estuary, it did create a long-lasting depression in the area which helped determine the location of the bay. 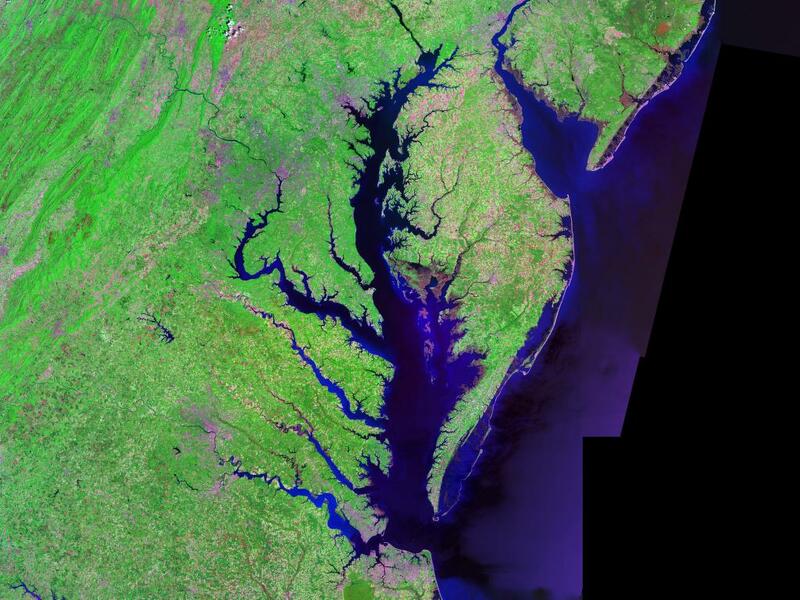 Landsat satellite picture of Chesapeake Bay (centre) and Delaware Bay (upper right) – and Atlantic coast of the central-eastern United States. Credit: Landsat/NASA. Distributed by Wikimedia Commons. The Chesapeake Bay Bolide Impact: A New View of Coastal Plain Evolution: USGS Fact Sheet 049-98.